Our Beachfront Villa is our premiere accommodation option, perfect for families or traveling couples who seek spacious island living. This self-contained villa offers a prime beachfront location, modern luxury, and contemporary style enriched with touches of traditional Cook Islands design. 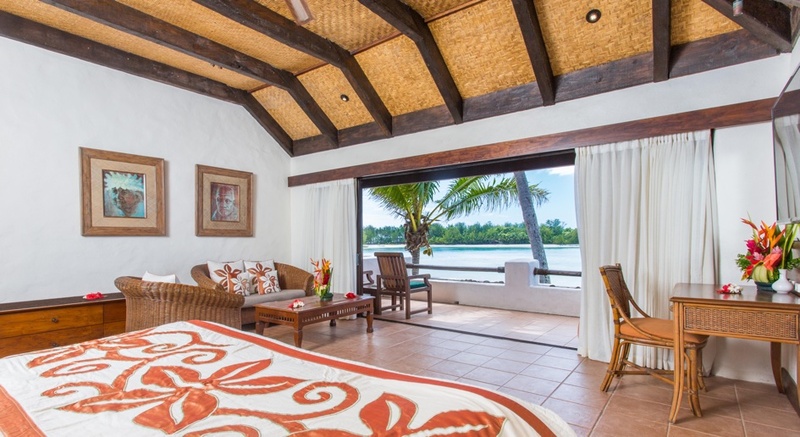 Our exclusive Beachfront Villa is a standalone multi-level facility with a master bedroom and ensuite bathroom upstairs, two bedrooms and two bathrooms downstairs. This villa contains a flat screen TV with in-house movies, WiFi, USB charging outlet, room safes, private laundry facilities, full kitchen and bar and private courtyard with BBQ hire available. Privately located with easy access to the beach, our Premium Lagoon View Villas are spacious and inviting, boasting beautiful views across the lagoon. These self-contained villas offer large living areas, with a unique mezzanine lounge, nestled beneath a high ceiling, and contemporary style enriched with touches of traditional Cook Islands design. Our Premium Lagoon View Villas are standalone multi-level facilities with a master bedroom and ensuite bathroom upstairs, two bedrooms and a bathroom downstairs. These villas contain a flat screen TV with in-house movies, WiFi, USB charging outlet, room safes, private laundry facilities, a full kitchen, bar and their own private outdoor courtyard. Our Premium Garden Villa is the perfect island retreat for a family or group. They are fully self-contained and are designed in a way that is perfect for both entertaining and relaxing. Located in the gardens, these rooms are in close proximity to resort facilities such as Sandals Restaurant & Barefoot Bar and the pristine white sands of Muri Beach – all just a short walk down the garden path. Each self-contained spacious villa features a private courtyard, sheltered outside dining area with the option of BBQ hire, two bedrooms, each with a private ensuite, one super king bed, two king singles, air conditioning, flat screen TV, in-house movies, WiFi, USB charging outlet, room safe and a fully equipped kitchen. Dine barefoot with sand between your toes for breakfast, lunch & dinner in the Sandals Marquee Beachfront Restaurant. A beautiful setting on the shores of the amazing Muri lagoon, this al fresco dining experience is second to none. And if weather is inclement enjoy dining amongst the tropical gardens & waterways that surround the inland Sandals Restaurant. Whatever the venue, an array of fresh fruits, juices & bakery items are always in plentiful supply on the tropical breakfast buffet table (complimentary to in-house guests) while those wanting a more substantial start to the day may choose one of the many cooked breakfast options available. The All Day Menu, available every day from 11am to 9.30pm boasts a wide selection of salads, sandwiches & meat dishes with more a la carte dinner speciality items offered on the menu in the evening. Try the Chef’s speciality dish – The Pacific Sizzler – local fish on a sizzling platter with sautéed vegetables drizzled with coconut lime sauce. Vegetarian options are many & of course a kid’s menu is available for our junior guests. An excellent range of wines, beers, alcoholic (& non-alcoholic) beverages can be enjoyed during your meal or sit in the Barefoot Bar or the adjoining courtyard overlooking the lagoon & sip one of the many amazing cocktails or mixed drinks that Barefoot staff have become famous for. Listen too, for the sound of the conch shell heralding the start of Happy Hour at 4pm but if you miss out then join the team again for another Happy Hour each evening at 8.30pm. How cool is that! In room dining options are available & for those wanting to celebrate a special anniversary or simply want to express their love to someone special, there are private & very romantic dining options available. Reservations for dinner are essential & casual diners are welcome. Enjoy a walk through the resort’s stunning gardens, relax with a book by the fresh water swimming pool, or laze on a sun lounger on the beach under a palm tree. Explore the lagoon and the motus (islets) by kayak or stand up paddle boarding. Discover the underwater world through snorkelling or book a lagoon cruise of the resort’s very own glass bottom lagoon cruiser. Participate in daily beach hut activities. Pacific Village Salon, located in Muri Village directly across from the main entrance of Pacific Resort Rarotonga, provides professional hair styles, beautiful color, precision cutting, bridal styling along with spray tanning, Shellac nails and microdermabrasion. Pacific Resort Rarotonga is the perfect choice for your wedding or renewal of vows, offering the ultimate combination of romance, beauty, and celebration. Take the stress out of planning your wedding. Pacific Resort Rarotonga offers dedicated wedding planners to make your dream wedding a reality. The Cook Islands allow couples to marry after three days in the country prior to the ceremony. Paperwork required involves birth certificates (in English), original passports and any divorce documents, if applicable. Should you select the Island Princess Wedding Package, your ceremony will begin with a traditional Vaka lagoon ride with an island warrior, a shell horn announcement and the aisle will be decorated with a hand woven floral palm archway; just a few of the distinct services that will make your wedding day an everlasting memory. Children of all ages are welcome at Pacific Resort Rarotonga, year round. We offer a complimentary Beach Hut Kids Club to children 6-12yrs. Daily tropical breakfast and complimentary use of snorkelling gear, kayaks and stand up paddle boards.